And now for a little change away from cats. This small sequence was taken on a 20 minute stroll down a section of International Drive Orlando next to ICON Orlando. I’m using the Olympus E-M5 and M.Zuiko 45mm/1.8 prime. ICON Orlando used to be called Coca Cola Eye of Orlando for some number of years, and then when it first opened it was just Eye of Orlando. Just to show how long it’s been since I’ve been around there to notice the name change, the name change took place around May of last year. And no, in all the time it’s been there, I’ve never ridden it once. 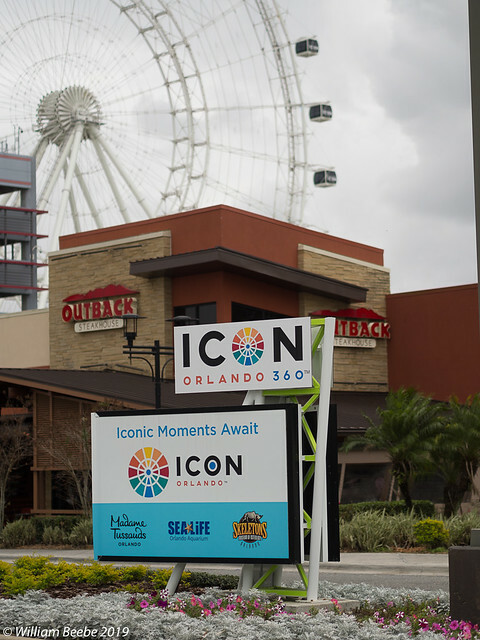 The signage is interesting; the upper small sign wants to call it ICON Orlando 360, while the lower larger sign is missing the 360 portion. I used the E-M5 with the 45mm again wide open at f/1.8. I was located right across the street at the start of a crosswalk. The foreground signs are nicely separated, while the background with the ferris wheel (the aforementioned ICON) is nicely out of focus; enough not to compete with the foreground but enough suggested detail to be recognizable and to give context. 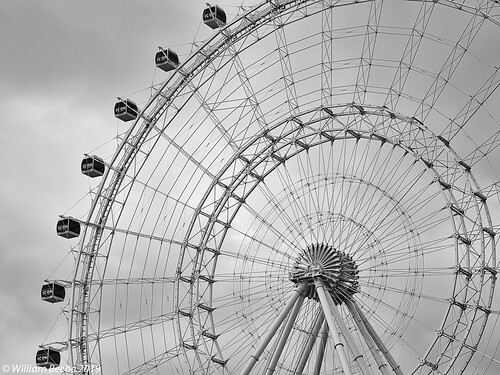 From another position just south of the sign, I recomposed and took a photo of the ICON wheel. I have a morbid fascination with this structure because of my engineering schooling. As an engineering freshman I had a course one quarter in statics and dynamics. This is the kind of structure a sadistic TA would have given us as a lab problem to analyze. For this exposure I closed the 45mm’s aperture down to f/4 and dialed the camera’s exposure compensation up two stops. The sky was overcast with light clouds and wanted to overwhelm the E-M5’s exposure, throwing everything on the wheel into deep shadow, so the added +2EV lifted the detail. I post processed the RAW in Nik’s Silver Express 2 to bring out some of the cloud bank detail as well as emphasize the details of the wheel itself. 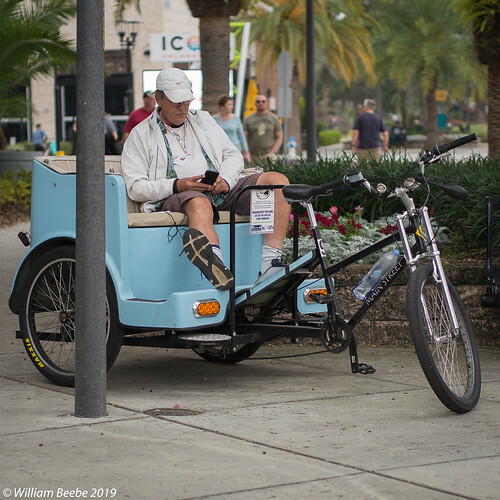 As I was walking around I-Drive I came across this gentleman taking a small break on his pedicab. He appeared to be between fares, checking his smartphone. Once again I shot this with the 45mm lens wide open. The foreground is nicely in focus with good foreground/background separation. My only complaint is the composition; the out-of-focus couple in back of the man’s shoulder to the right is a distraction as is the other pedestrian on the other shoulder. I’d have had a cleaner background if I’d been paying better attention. Without those elements in back this would have been a nicer photo. Regardless, it shows the ability of the 45mm to do a really nice job. 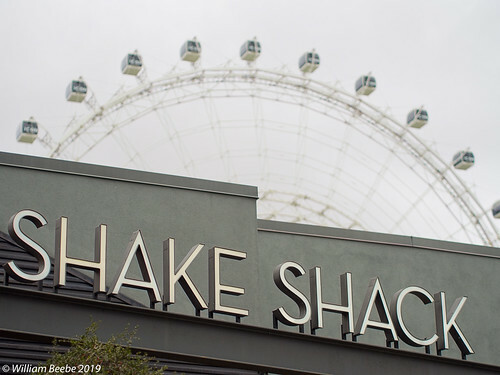 There’s a Shake Shack in front of the ICON on I-Drive, and it provided another opportunity to play with selective focus. In this example I opened out the tilting rear view screen, dropped the camera to waste level, and then looked back up to create this composition of the top edge of the wheel over the building. At f/1.8 I was able to get sharp focus on the signage while the ICON was again nicely out of focus; just enough to give visual context without causing too much clutter. Finally this road side double sign provided an opportunity to play with plains of focus using the 45mm at f/1.8. The signs themselves, being flat, are nicely focused, but everything else is out of focus with just enough context to know it’s in front of the Shake Shack. 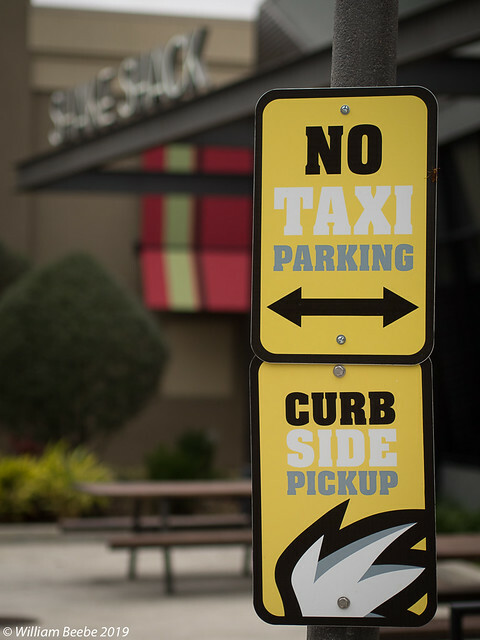 Besides, I had to wonder if taxi passengers were allowed to pull up for curb side pickup. I’ve been using Olympus digital cameras since 2006 when I purchased the Olympus E-300 two lens kit form Newegg. It had the Kodak four thirds sensor at 8MP. At first I was frustrated with its output until I spent the time learning how the system worked together, and then I was fine. So far, after 12 years, I’m still an Olympus camera user, along with several Panasonic bodies and lenses. The micro four thirds system is superb.